As business-to-business (B2B) decision-makers continue to expand their use of social networks for information and research, B2B marketers see an opportunity to reach and influence their audience on such platforms. Still, for most B2Bs, social media has not yet been ingrained into the bigger business and marketing strategy, potentially making it harder to achieve goals. Measuring social media’s impact on revenues helps B2Bs embarking on their first social media strategy or companies assessing and refining their current program. Most B2Bs haven’t mastered social attribution and are still focused on engagement metrics. B2Bs need to research and understand buyer behavior on social media before executing a social content marketing plan. This can be done through social insights. The savviest B2Bs are creating content that is relevant to their buyers and then sharing it in a targeted way across social networks. The most effective social platform to use depends on each company’s unique priorities and goals. 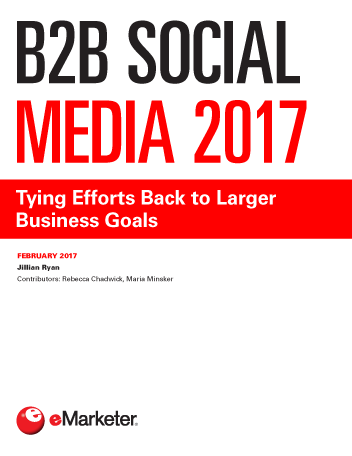 A trend gaining traction for B2Bs in 2017 is using one-to-one relationships to extend social reach and influence. This is done through social selling, influencer targeting and employee advocacy programs. Organic social media efforts can and should be amplified through advertising on social platforms. These initiatives must be targeted for maximum success. "More than 84% of US B2B marketers said social media was a marketing tactic used to acquire customers, according to the “State of Pipeline Marketing 2016” report."